Gardens and markets are full of summer's bounty. 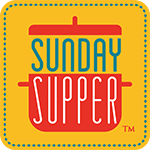 The #SundaySupper crew is sharing recipes for canning, freezing, and all types of preserving for saving the goodness of the season to enjoy all year long. This event is being co-hosted by Stacy of Food Lust People Love and Heather at Hezzi-D's Books and Cooks. Thanks for all the inspiration! 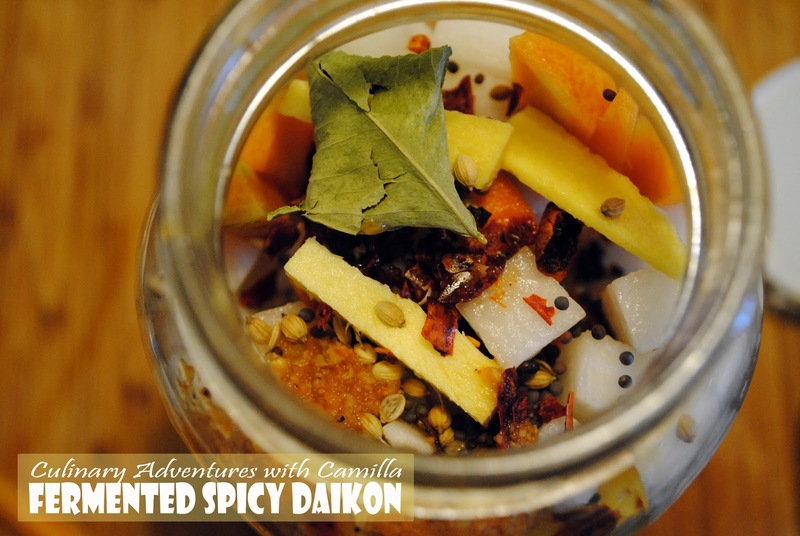 Awhile back I had a conversation with my cousin about pickled daikon. Since I've been on my fermentated (versus pickled) kick this summer, I decided to ferment some. 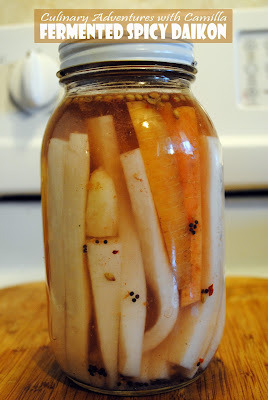 I love fermenting daikon and other radishes because they tend to acquire a very nice sourness while retaining their toothy crunch. Dissolve the salt into the water to make a brine. Place everything in a wide-mouth glass jar, packing the spears vertically. Let it sit for 4 weeks in a cabinet, but taste it once a week to see how the flavor is developing. The long slow cool ferment is great. And I decided that these spears would make a wonderful addition to a fun summer cocktail. 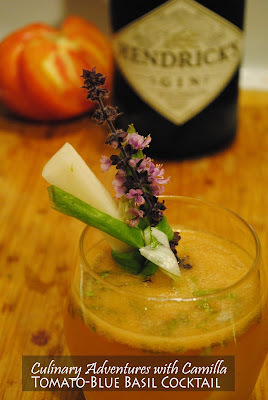 I used the fermented daikon spears as a garnish in my Tomato-Blue Basil Cocktail. Place the tomatoes in a fine-mesh strainer set over a medium bowl. Using a muddler, firmly press out as much juice as possible. You should have almost 1/2 cup of juice; set aside. 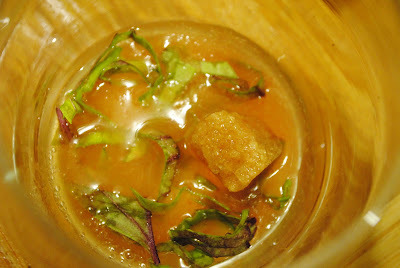 To make 1 drink, place 2 leaves, 1 brown sugar cube, and 1 T of fresh tomato juice in a glass. 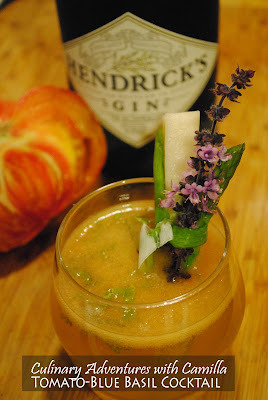 Muddle until the basil is fragrant. Add 1 T orange juice, 1-1/2 ounces of gin, and fill up with sparkling water. Stir to combine. To garnish, tie together 1 daikon spear, 1/2 asparagus spear, and 1 blue basil blossom with a green onion. 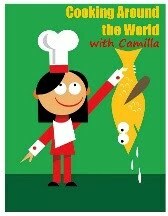 I have pickled but never fermented, Camilla. Your intriguing cocktail has inspired me to try! Oh great. Now it looks like I'll have to try fermenting too. I'm so curious as to how this daikon tastes. I'm thinking it would be awesome as a side for sushi. I just made pickled daikon---and I'm certain your spicy fermented version is just as wonderful!! This is brilliant! Save me some. This looks like a great app to bring out at a party!